Thank you for your company here this week, friends! Halloween is becoming a bigger and bigger event here in the UK every year; I remember when I was a kid and it was a struggle to even find a place to buy pumpkins - now, the supermarkets have whole isles dedicated to halloween decor. A lot of the off the shelf Halloween decorations here in the UK are quite tacky, so I prefer to make something a little more stylish. If you're looking to do the same, why not try out these great ideas from Sweet Paul magazine? My personal favourite is the 'boo' stitch frame. Which one would you like to try? Wishing you all a spooktacular weekend! Have a great weekend Will! Oh man, I just adore the matte black on the pumpkin, matte paints look so good!! Thank you for popping by Will, happy weekend! I wish Halloween was bigger here in Australia! That pumpkin with the glitter detail is unusual, I love it! I love the pumpkin with some sparkle! Halloween isn't so big here in Finland either, we do have lots of tacky children's wannabe-scary jack'o'lanterns and witches with black cats and so on, but nothing so cool and actually goodlooking stuff. Even so, tonight we are throwing our legendary halloween party again, we'll have good old-fashioned b&w horror films (Dracula, Nosferatu, Mummy etc) running on the backround, we have a pumpking carved and I'll be dressed as a gypsy fortune teller and my bf as Abraham Lincoln. Thank you for these ideas, we will surely try them next year! Now it might get too busy with spraying pumpkins black, as I'm still working and the guests should arrive in 8 hours. I have not yet celebrated Halloween, but it's getting bigger and bigger in Sweden too. IF I would celebrate I would love to attend a pary decorated like in this post, or like in your post from 19 October, styled by Manvi Drona-Hidalgo. The stiched boo is lovely, and I really like the candle stick in the top pic, sprayed in very matte black. Gotta love matte black pumpkins! Just caught up on your prior posts, loved the pencils and the posts on you! Now there you have some perfect Halloween decor. Love it all! What will you be for Halloween Will? It's been such an over-the-top huge business for North America...kinda nuts. Have a good weekend! Ooh thanks for this - looking for ideas for next weekend! 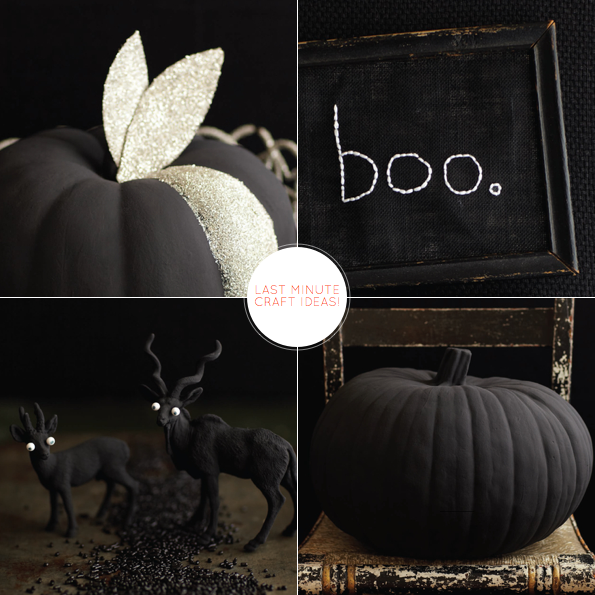 Love the boo picture and the matt black pumpkin! Spooky! This is so good! 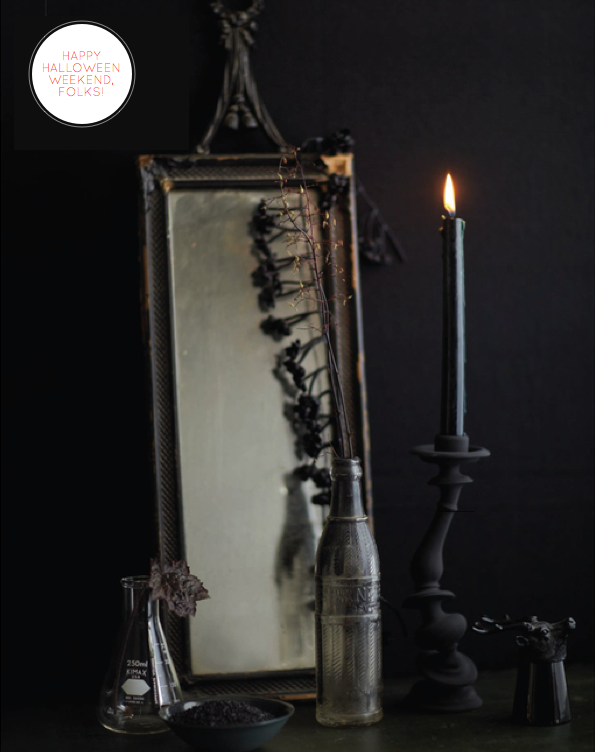 Love the styling in Sweet Paul and I think I want to try every recipe in this issue. Happy Halloween! Thanks so much, folks. Hope you all had a lovely weekend! I ended up spray painting my pumpkins gold - I've included a picture in tomorrow's 10 things post! Love the Halloween vignette in the first picture! All wonderful Halloween ideas. Have a lovely Sunday, Will!